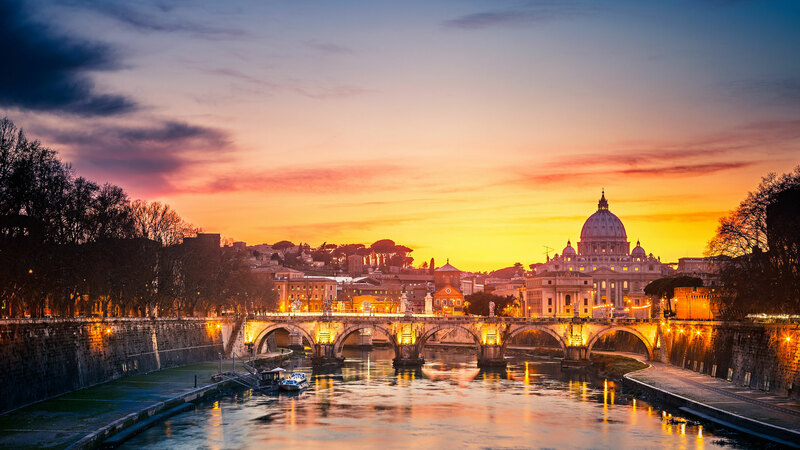 Tiburtina that climbs up the green, olive-clad hill, the large Piazza Garibaldi, bor-dered on the left by a spacious panoramic terrace, offers views onto the entire plain and Rome in the distance. 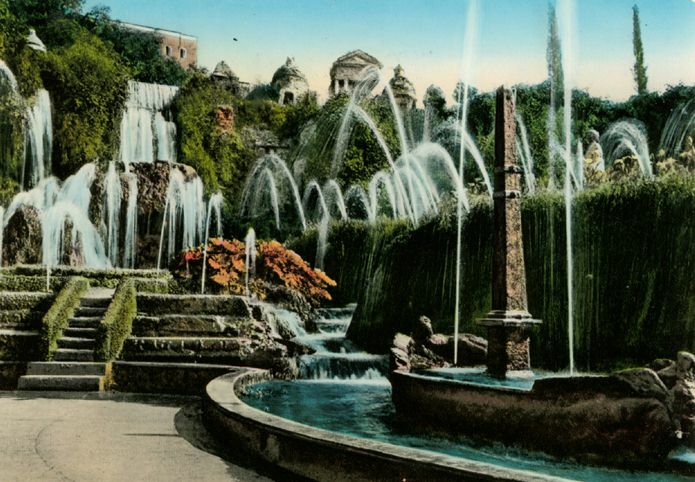 Tivoli is best known for its three villas (Villa d’Este, Hadrian’s Villa and Villa Gregoriana), yet the city is rich with several other interest-ing monuments and sites that are worth visitine, if only in passing. 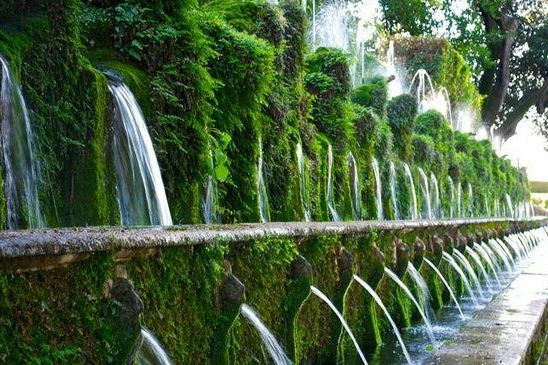 The distin-guished monuments scattered through the town, their panoramic position, and the waters of the Aniene river, seemingly omni-present in waterfalls, cascades and conduits for industrial use, help create the intimate surroundings for the villas. A brief itinerary begins at Piazza Garibaldi, at the end of which, on the left, is Piazza Trento. Here rises the Church of Santa Maria Maggiore (known to locals as S. Francesco), a beautiful 13th-century Romanesque-Gothic building. From Piazza Trento, nearby Via della Missione leads towards the old part of town, with its medieval quarter and Romanesque-Gothic churches. Narrow undulating streets and pic-turesque medieval houses on Via Campitelli and Piazza San Nicola are a pleasantly surprising feature of this small town. From here, Via del Colle leads to the Romanesque Church of San Silvestro, with particularly noteworthy 12th and 13th-century frescoes in the apse. Further down is the Duomo, dedicated to San Lorenzo, rebuilt in the middle of the 17th century. Highlights include the fine porti-co and the Romanesque campanile (12th century). Inside is an expressive Deposition from the Cross (one of the most famous wood sculptures of the 13th century) and tlx equally important Tryptich of the Savior, kept in an embossed silver casing. a valu-able piece of silver-craftsmanship that dates to 1449. The Duomo closes one of the short sides of what was once the Forum – the center of public and private life in the city – during Roman times, as evidenced by the many important relics found in the area. Going towards the Aniene, at the level of Ponte Gregoriano, is Piazza Rivarola. 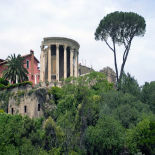 From there, Via della Sibilla goes left to one of the most famous monuments in Tivoli, the so-called Temple of the Sibyl. The true name of the temple is not known, though it is thought to have been dedicated to Vesta, or else to Hercules Saxanus, who was particularly venerated in Tivoli. The adjacent rectangular temple was probably the one dedicated to the Sibyl. 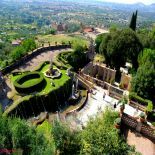 The temples rise from a rocky footing, overhanging the romantic park of Villa Gregoriana. When Publius Elis Hadrian assumed power on the 2nd of August, 117 AD, the Roman empire was at its maximum extent and power. 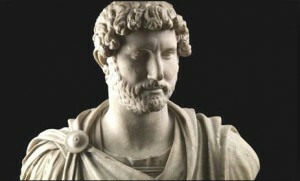 The second Spanish-born Roman Emperor (after Trajan) Hadrian was a wise politician and a first-rate military comman-der. Despite numerous victories, he under-stood that Rome’s conquering period had come to an end, and that the empire needed stability above all else. Perhaps the most complex and compelling of all Roman emperors, Hadrian was a highly-cultured man. He appreciated all forms of art, but had a special passion for architecture, which he indulged even while traveling, as he was accompanied by an army of smiths, masons, jointers and car-penters. In England, Hadrian rebuilt London in 122 AD, about sixty years after the fire, and he also constructed the famous Valium, a long defensive wall that was named after him. In Athens, where he spent much of his time trying to strengthen Rome’s eastern boundaries against the incipient threat of barbarian invasion, the emperor carried out conspicuous restoration projects and enriched the city with new buildings of great beauty. Hadrian understood the strongest cultural and civil needs of his time, and brought together the refinements of Greek culture and the traditional governing skills which the Romans had developed over the cen-turies. This combination was embodied in the Villa he built. The charming mix of ruins and natural landscape makes it a powerful romantic attraction, and the deeply innova-tive nature of Hadrian’s architecture is self-evident in each building. As indicated by the dates printed on the bricks of the build-ings, this extraordinary complex was con-structed between the years 118 and 134 A.D. at the foot of Tibur – today’s Tivoli – a town founded in the 9th century BC on the border of the calcareous terrace stretching from the Tiburtini Hills toward the Roman countryside. 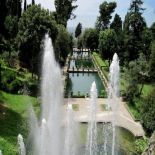 Four years after the completion of the Villa, the emperor died at age 62 from cirrhosis of the liver in Baia, where he had gone seeking mild weather and a cure for the disease. It is difficult to imagine the scope of the original Villa; only one fifth of the three-hundred hectares that originally occupied the site are visible today. The project was so gigantic that neighboring Tibur went through a phase of urban and demographic expansion both during the construction of the Villa and afterwards, when many of its inhabitants were employed here. The Villa’s unique size and superb level of artistic refinement should not obscure the fact that large villas harmoniously set in the land-scape were a distinctive feature of Roman architecture. In fact, as early as the Republican era, the countryside was studded with spacious rustic villas fully equipped to work as efficient farms with ample storage facilities, olive presses, mills, fish reser-voirs, stables and pigeon-houses. In the 1st century BC. during the transition from republican to imperial times, the rustic Villa lost its role of productive center to become, instead, a status symbol. Accordingly, utili-tarian buildings were substituted with gym-nasiums, porticos, peristyles, vestibules, cryptoporticos, exedras, verandas and nympheums. 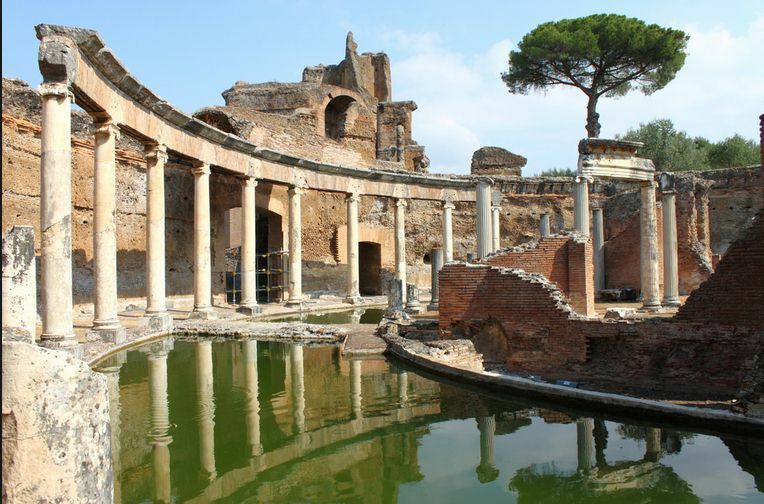 The first glorious example of how aristocratic villas might evolve into imperial residences was the Domus Aurea, the realization of Nero’s dream of building a city-villa. Almost nothing remains of the fantastic masterpiece of the “crazy emper-or”, but a few decades later Hadrian elevat-ed this native architectural invention to its highest splendor, infusing his Villa with the refined taste of a restless soul. 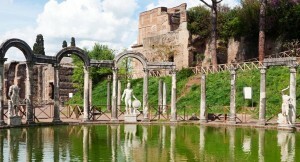 Among Villa Adriana’s best-known features are the numerous references to those places that had most impressed the emperor’s memory and spirit, which are mentioned in a list by Elio Sparziano, one of the writers of the Historia Augusta. But only the Canopus, as we will see below, can be identified with one of these places. All the other names were sug-gested by Renaissance or later scholars. Modern scholars tend to recognize the mark of Hadrian’s political program, which for the first time put the provinces on par with Rome, in the Villa’s bizarre and even capri-cious reproductions of exotic architecture. But in reality, the designs employed were more a matter of personal interpretation than of mere imitation. Hadrian’s immediate suc-cessors, the Antonini, used the Villa as their summer residence, but after them the Villa fell into disrepair. Diocletian restored it at the end of the 3rd century AD. Shortly afterwards, according to several texts, Constantine embellished Constantinople -the new capital of the eastern empire – with many artistic pieces taken from Villa Adriana, which from that time shared with most of the great Roman monuments a des-tiny of neglect and damage (Gothic and Byzantine armies alternatively camped in the Villa’s grounds during the terrible Gothic wars) and even more devastating pil-lages in the 16th century, during the first archaeological excavations. About three-hundred masterpieces have so far been discovered and put on display in museums and collections all over the world. A mere trifle when compared to the crowd of statues and objects which once filled the Villa, vying in numbers with the incredibly rich contents of the Vatican Museums today. Some of these works definitely deserve mention, if only to imagine how they might have once adorned the Villa. Among Roman copies from Greek originals: the famous Discobolus of Mirone, housed in the Vatican Museums, and the Tvrannicides at the Naples’ National Museum (5th centu-ry BC); Praxitele’s Three resting satyrs, one of which is displayed at the Capitoline Museums in Rome (4th century BC). Unforgettable sculptures from the 3rd to the 1st centuries BC are the Niobide (Vatican Museums), the Crouching Venus by Doidaldas (Museo Nazionale Romano, Rome), the Two Centaurs with Faun in rosso antico marble (Capitoline Museums) and a Faun (Vatican Museums). 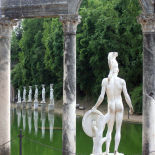 Several original Roman sculptures such as the Colossal masks and the Ocean, Two telam-ons, Two peacocks, a Deer’s head and, above all, the gigantic Antinoos represented like Bacchus, are also on display at the Vatican Museums. Of remarkable interest is the large group of sculptures made in the Egyptian style, divided between the Vatican Museums and the Capitoline Museums. 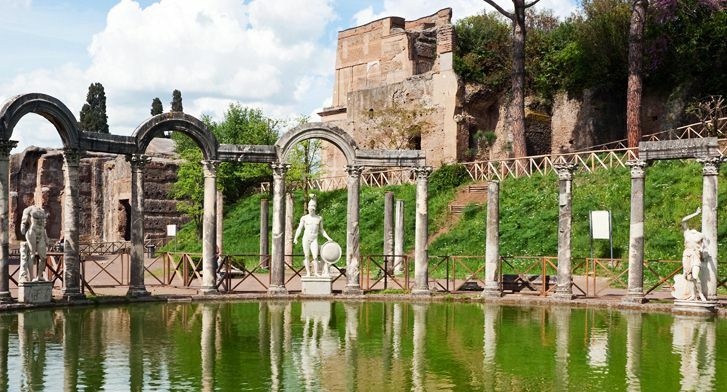 Only a few of the countless decorative pieces that contributed to the extraordinary elegance of Hadrian’s Villa are exhibited in museums and public galleries. 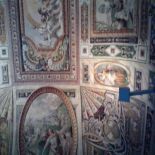 The rest have disappeared into private collections, Finally, some splendid mosaics include: the Mosaic of the doves at the Capitoline Museums and the noteworthy collection at the Vatican Museums, which includes the panels with Animals, in the Room of the Animals; the Theater masks. which gave the name to the famous Gabinetto; and the cheerful Flower garlands in the library. fish. Some dates and names marked in rough letters are still visible: Portia. Nabuli, Amore, Cremona. Laurentina, Roma and Cornelia were perhaps names of women who had been clear to the artisans who worked on the floor. The extremely rich decoration must have been truly magnificent in its time. 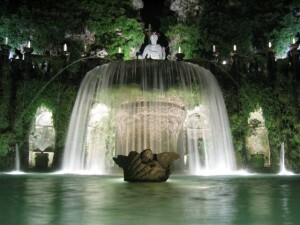 Most of the precious sculptures that adorned the grotto are now in the Capitoline Museum in Rome, where they were placed after being acquired by Pope Benedict XIV; among those that remain are two statues of Amazons, Minerva and, notably, Diana the Humress with her bow, to whom the grotto is dedicated. Aside from the usual Caryatids and the relatively rare stuccoed quince branches, the walls are embellished with mythological scenes featuring Minerva, Neptune and several of the Muses. The fountain of Diana was a delightful work in relief, enlivened by gold and splendid colors, and by the precious stones that were set into the eyes of the Muses. Although some of the vivacious color has been lost, this still remains the most elaborate fountain of the Villa. 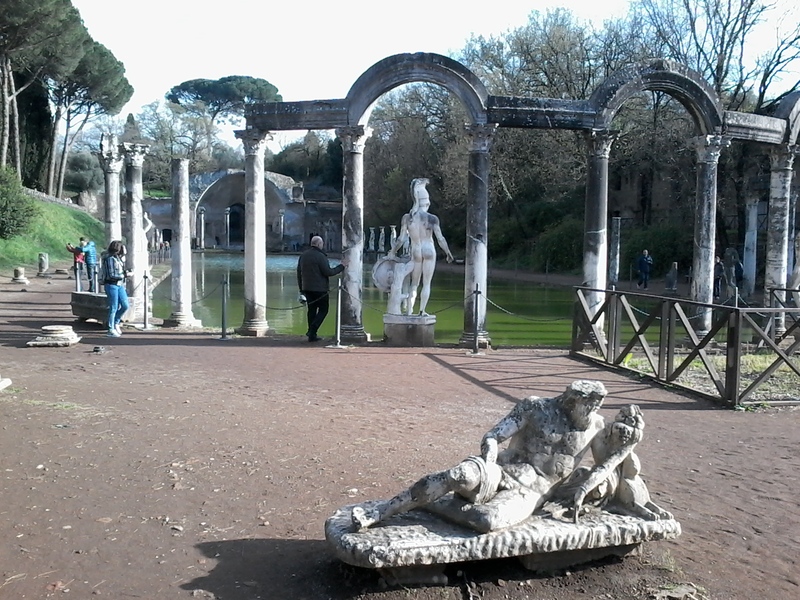 The central axis of the Villa leads down to the calm and elegant fountain of the Bicchierone (large drinking glass), con- structed in 1661 according to designs by Gian Lorenzo Bernini. 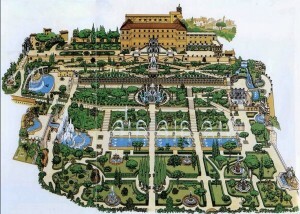 The fountain, therefore, does not belong to the original plan of the Villa, but was added about a century later. The cheerful, bold harmony and fine style of the Bicchierone clearly suggest the involvement of the great master. who worked on several projects at the Villa d’Este. 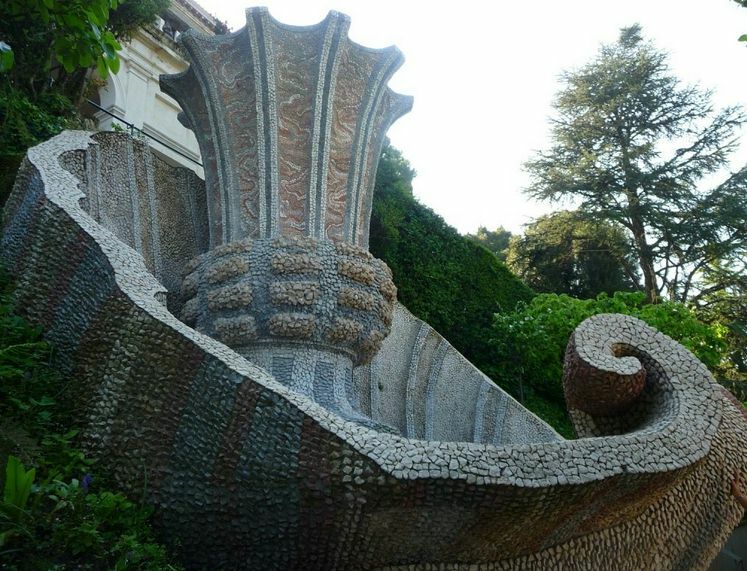 The exquisite architectural lines of the fountain, representing a fine chalice held up by a giant sea-shell. owes its par- ticular charm to its harmonious and serene water play. 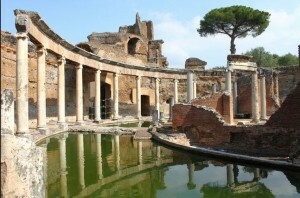 some of the most important buildings in ancient Rome. The large platform, supported by an impressive foundation, offers a ﬁne perspective. It was designed by Pirro Ligorio and perhaps also by Ippolito II himself, and built in 1570 by fountain-maker Luzio Mac- carone. It may have been used originally as a backdrop for a small open-air theater. It is reached by a small bridge that spans a curving canal, in the middle of which, along a course representing the Tiber, there is a scale model of the Tiberina Island in Rome in the shape of an ancient Roman boat. The island was the site of a hospital and the uncoiling serpent alludes to Aesculapius, the god of medicine. 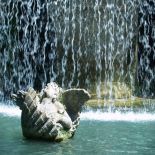 The canal is formed by the conﬂuence of two streams, representing the Tiber and the Aniene respectively, which come from the rocky wall in the background; the former springs from a cavern housing a statue ofthe Tiber, While the latter falls in attrac-tive, frothy cascades from the base of the statue representing the Aniene. 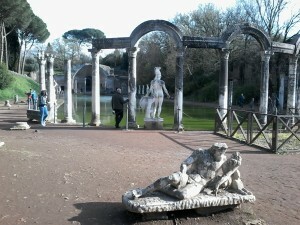 At the center of the Rometta is a statue of Victorious Rome, sculpted by Pietro Lamotte from a design by Ligorio, along with the She-wolf nursing the twins Romulus and Remus. Today little remains of the original models, due to the passage of time and the fact that part of the ensemble (including the Colosseum, Capitol Hill, Pantheon and the Arch of Titus) was demolished. Nonetheless, the Rometta is still an expression of pure beauty as water gushes forth everywhere: in the air, on the ground, in the light and in the shadows. Flowing glasslike and transparent, boldly darting into the air, softly arching, merrily falling down, crossing and overtaking and melting into one another, then fading away iri- descently into the air, in a glittering halo of life, light and celebration. vigorous, inspiring in their sumptuousness, reﬁnement and art. But no more – the marble is corroded and the trickling water reveals the patina of age. The Hundred Fountains border a long, straight path leading from the “Rometta” fountain (also known as the Fontana di Roma) to the Fontana dell’Ovato. The water falls into three long parallel channels arranged one above the other, forming one single water play. 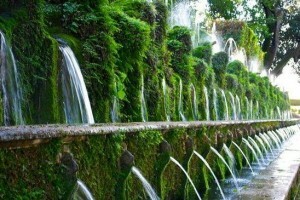 Allegorically, the thin spurts of water, fed by the hundred jets, represent the Aniene river which runs from Tivoli to Rome, where it ﬂows into the Tiber. Hanging above the highest channel are sculptures of lilies, obelisks, boats and eagles, all the Cardinal’s beloved symbols: the lilies rep- resent unforgettable France, the boats St. Peter, and the obelisks unfulfilled papal power. The eagle belonged to the coat of arms of the d’Este family. The entire marble wall that separates the upper channel from the middle one was carved with episodes from Ovid’s Meta – morphoses. But what little remains of these carvings is hidden under a graceful mantle of verdant foliage. Pirro Ligorio designed the 100 meter-long path, and was responsible for the two orders of overlapping basins on the uphill side. Although the rest of the Villa is full of beautiful scenes, no other fountain matches the bewitching charm of the Hundred Fountains. Villa once ﬂowed nearby. 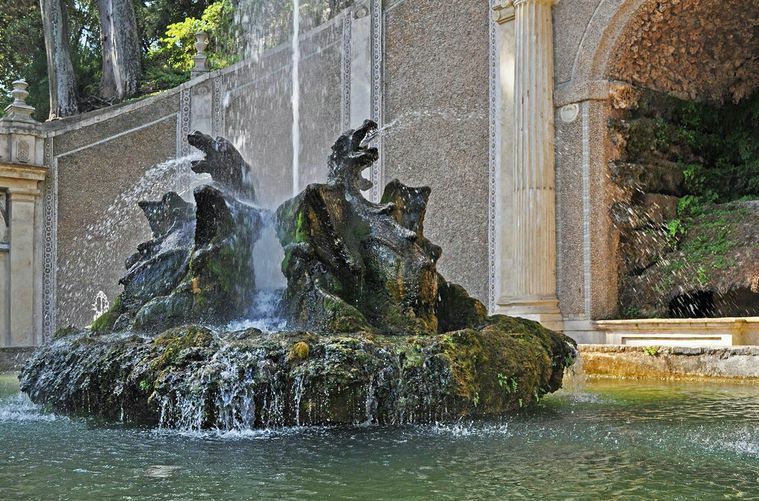 The fountain takes its name from its egg- like, oval shape, and it is perhaps the most typically baroque fountain in the Villa. The fountain appears Particularly elaborate, thanks to the profusion of rocks and ornamental boulders which Curzio Mac- carone showered upon it in order to convey the wild atmosphere of Mount Helicon. In execution, the intended “naturalistic” effect is actually rather bombastic. Nevertheless, the general appearance of the fountain is harmonious as well as impressive, and thus quite pleasing on the whole. The Pegasus (winged horse) atop the fountain is placed so well that it seems truly about to soar into the air. A good ways down the central axis is a simple statue of the Sibyl of Tibur (Sibin Albunea) holding the hand of her son Melicerte, symbolizing Tivoli. The statue is the work of the Flemish sculptor Giglio della Vellita. On either side are marble figures by Giovanni Malanca representing the Aniene and Herculanean rivers. 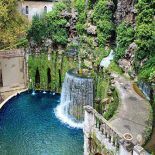 The tall, rocky part of the fountain is bordered by a’half-moon terrace with a marble balustrade overhanging the mighty and crystal clear ﬂow of water that drops down in a resonating dome. The basin below is lined by a semi-circle of pilasters which form of a nymphaeum. In the niches statues of nymphs hold vases from which water flows. This is the work of Giovan Battista della Porta, inspired by Pirro Ligorio. In the middle of the basin there is a large shell with open valves, originally in the basin of the nearby Hydraulic Organ. The colonnade of the nymphaeum is decorated with French lilies and d’Este family eagles depicted in mosaics (in poor condition). The parapet of the basin is lined with lively ceramics featuring details of the d’Este coat of arms. Opposite the fountain there are tables with Roman feet and two stucco statues in their own niches. Centuries old plane trees embellish the scene. Though perhaps not a perfect all-around work, the Fountain of the “0mm” is admirable for its general harmony and its profusion of ornamental motifs which often served as inspiration to numerous artists. A shady and attractive lane to the left leads to a clearing where stands the Fountain of the Organ, so named because it was once connected to a water-driven mechanism that imitated the sounds of an organ. The fountain consists of a large structure designed by Pirro Ligorio along baroque lines. A large oval basin at the base of the fountain is encircled by a lovely balustrade in mixed style. An apse opens at the center of the fanciful structure; four colossal rough-hewn Telarnones by Pirrin del Gagliardo support the sides of the mock arch; and above there are multi-col- ored stucco panels depicting mythological scenes with Orpheus, Marsius, Apollo and others. A profusion of ornamental motifs stretch – es across the facade, including abundant grotesque coats of arms, ﬂowers, sirens, winged victories and sea-shells. Taken together, the stucco, rustic mosaic, scale, and fresco produce a sumptuous effect. 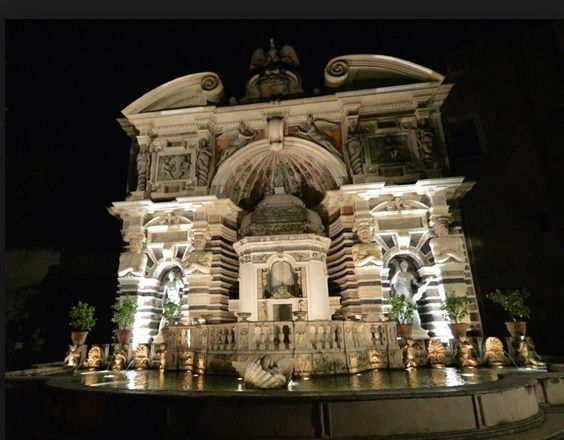 The tympanum over the facade is inter- rupted at the center by the mighty eagle with its outstretched wings sitting atop the coat of arms of Cardinal Alessandro who continued the work of his uncle Ippolito at the Villa. . fountain is encircled by a lovely balustrade in mixed style. An apse opens at the center of the fanciful structure; four colossal rough-hewn Telarnones by Pirrin del Gagliardo support the sides of the mock arch; and above there are multi-col- ored stucco panels depicting mythological scenes with Orpheus, Marsius, Apollo and others. In the middle, beneath the apse, there is a delightful and beautifully proportioned Opening, designed by Bernini to house the Hydraulic Organ. Niches to either side contain mediocre ornamental statues. The floor of the apse juts out in front of the basin, forming a small terrace enclosed by a lovely balustrade of mixed style; on the sides, rows of cherubs cast their cool Jets. The Hydraulic Organ, for which the fountain was originally named. was the ingenuous creation of Claude Venard, and was once one of the wonders of the Villa. Water dropped through a conduit into an underground cavity, forcing a strong draft of air through the organ pipes. Another heavy jet of water slowly rotated a toothed copper cylinder mounted on an iron frame which moved the keys of the organ, playing madrigals and motets. The listeners found it difficult to believe that the music came from a simple hydraulic mechanism and not a band of hidden musicians. On the whole, this agreeable fountain’s lively beauty makes it worthy of its great fame as one of the marvels of the Villa.